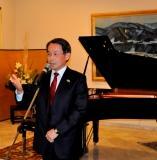 The Embassy of Japan in collaboration with the Austrian Embassy, the Embassy of Federal Republic of Germany, and the United Nations Information Centre organized a classical piano concert of Maestro Jun Kanno, an internationally acclaimed Japanese Pianist, on 19th May 2017 to celebrate the 65th anniversary of the establishment of the diplomatic relations between Japan and Pakistan. Jun Kanno travelled all the way from France to Pakistan and mesmerized the audience with his spellbound performance held at the Embassy of Japan. Maestro Jun Kanno lives in Paris and is a graduate of University of Toho in Tokyo. He has received prizes at several international competitions, and has played with the Munich Symphony Orchestra, the Chamber Orchestra of Berlin, the Chamber Orchestra of Prague, the NHK Symphony Orchestra, the Japan Philharmonic, the Korean National Orchestra and many others. Maestro Kanno regularly performs in London, Rome, Tokyo, Barcelona, Geneva and other major cities of the world. Ambassador Takashi Kuari in his welcome remarks welcomed Maestro Kanno to Islamabad and thanked him for providing a rare opportunity to experience live piano music. Ambassador Kurai said the Embassy of Japan in Pakistan has always strived to share Japanese culture with Pakistani people by holding various cultural activities. “We believe that sharing one’s culture brings people together. And I am always grateful when Pakistani people actively take part in our cultural events and enjoy our art and music”, said the Ambassador. Ambassador Kurai said that this year marks the 65th anniversary of the establishment of diplomatic relations between Japan and Pakistan and both the countries share a friendly bond, which has strengthened over the years. He also thanked the Austrian Embassy, the Embassy of Federal Republic of Germany, and the United Nations Information Centre for extending their cooperation in inviting Maestro Jun Kanno to Pakistan.